I saw an image circulated on Facebook recently. It showed a receipt being printed from a credit card machine. It said something to the effect of…”Transaction Denied. You have enough yarn.” Almost fell off my chair laughing. 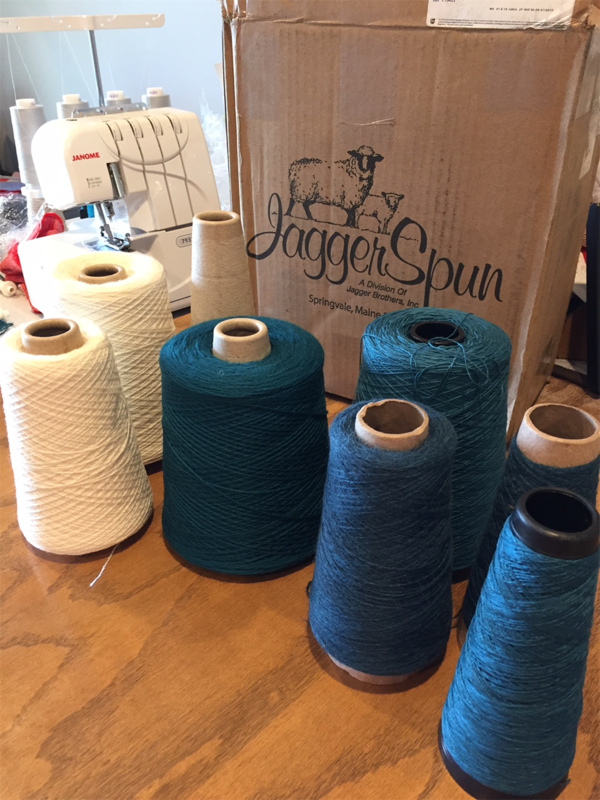 Looking around my cluttered studio at the boxes from Jaggerspun and Webs I recently unpacked, I realize I have broken my New Year’s resolution to weave throughout 2018 only using the yarn I already have. But things happen. Exhibitions come up. A collaborator for one exhibit says, “Let’s do a coat, in teal!” Sure, I exclaim! Now, a gorgeous winter coat is going to require wool or alpaca, neither of which I keep in great supply, especially not in teal. (The fact that I am weaving the wool yardage now, in the dog days of August is a story for another blog post.) So despite how true the credit card warning above is, I ordered more yarn. However, I have resolved (re-resolved?) that the other three entries in this exhibit will be woven from yarn in my stash: cottons, Tencel, bamboo, silk, and the usual cast of characters. But first I have to figure out how much I will need of each and how much I have on hand, just in case I need a little more or a slightly different size or color. So for this blog, I thought I’d offer a short tutorial on figuring out whether you have enough yarn on a given cone (or skein) to complete a project. How Much Yarn Do I Need for Warp? Step 1: Figure how long each warp end needs to be by adding together the desired finished length of each piece on the warp, fringe or hem allowances for each piece, take-up and shrinkage (about 20% is average), and loom waste based on your loom and warping techniques. Divide by 36 to convert inches to yards. Step 2: Figure how many warp ends you will need by adding together desired finished width, an allowance for draw-in (which you will work to minimize) and shrinkage (say 10%). Multiply the resulting width at the reed by the sett (ends per inch) you will use based on yarn size and structure. Add floating selvages to this total if needed. 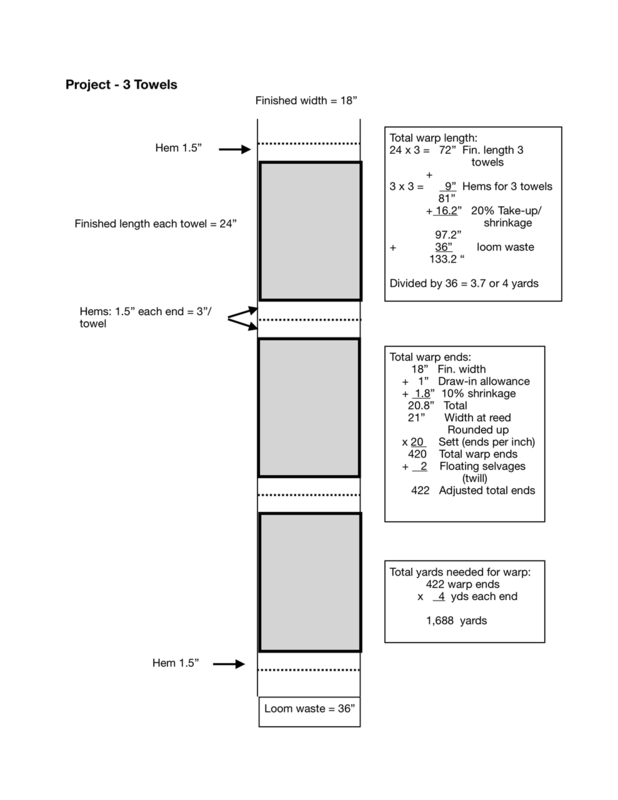 Step 3: Find total yardage needed for warp by multiplying total warp ends by total length of each warp end. Step 4: If using multiple yarns or colors in warp, repeat step 3 for the number of warp ends for each yarn. How Much Yarn Do I Need for Weft? Step 1: Figure how many inches of weft will be needed to weave 1” of cloth by multiplying width at the reed by desired picks per inch (same as epi if balanced weave). Step 3: Divide what is usually a really big number by 36 to convert to yards. Step 4: If using multiple wefts, figure this for each yarn according to number of woven inches for each. Shortcut: You will usually need a little less yarn for weft than warp. So if you allow the same amount needed for warp for weft, you’ll have enough, with a little left over. Note that you may need to adjust your take-up and shrinkage percentages for different fibers, i.e. : up for wool or down for linen or silk. You can obtain more accurate estimates for yards needed by weaving samples in your chosen yarn, structure and parameters. Keeping careful records of measurements on-loom and after wet finishing for each project will prove valuable if you want to repeat it, or even weave something similar in that same yarn. Step 1: Determine the yards per pound for your yarn(s). Find this info in descriptions from your yarn supplier, reference books, or Handwoven Magazine’s Master Yarn Chart, a free download from weavingtoday.com. If you can’t find it there or don’t know exactly what the yarn is, look for something close in the Master Yarn Chart OR use a McMorran Yarn Balance*. Step 2: Divide yards per pound by 16 to find out yards per ounce. Step 4: Multiply total ounces (or pounds) by yards per ounce (or yards per pound) to determine total estimated yards for each yarn. It is always a good idea to err on the side of having a little more yarn than you need. The alternative is maddening if you run out of either warp or weft yarn close to the finish line. Ask me how I know. What To Do If You Do Not Have Enough? 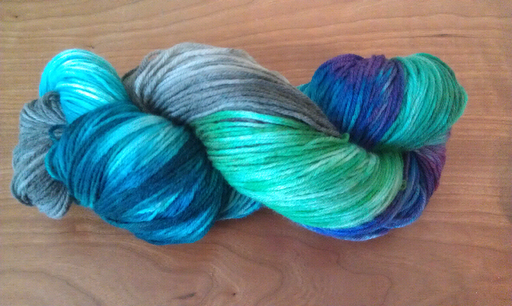 Well, if you are committed to not ordering more yarn, you have to get creative. That will be the subject of my next blog post. Want to hear all that again, in slow motion? 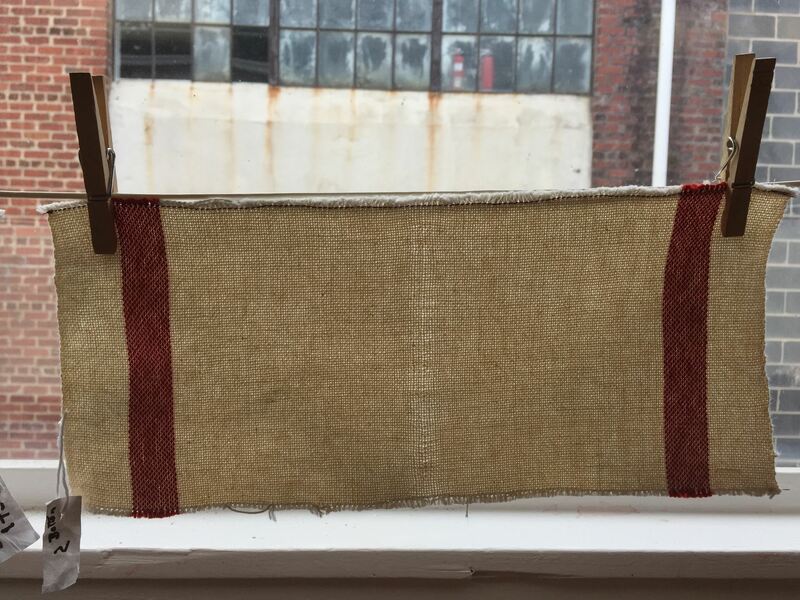 Purchase a few hours (or package) of Shaft-Loom Weaving on my Resident Artist page and schedule some one-on-one time with me in the Local Cloth studio. *McMorran Yarn Balance (right) has become a little hard to find, but is a great addition to any weaver’s toolbox. Instructions are included in package or easy to find online. For the last four years, I have participated in the Asheville Community Theater's fund raising fashion show. Categories are chosen every year and your garment must be made in the media/theme. The category that I chose and was accepted into this year was HARDWARE. (yes you can laugh now). I entered with my husband Keith to help with the metal fabrication and components. Other year's projects/themes included: nature - yards and yards of ecoprinted materials when I had never ecoprinted before, artist inspired - Monet - skirt out of yards and yards of of fishing line crocheted with colored beads to give the impression of color, and paper - taking patterned tissue pattern, cutting it up and then weaving the design into yardage. 1. I always hit a horrid snag in execution of each of these designs, something I was sure would work but doesn't. 2. I loose my vision and how to make it work within the category (I am often too narrow in thinking of my options). 3. I panic in trying to figure out the path forward - a little crying and stepping back to take time to explore options. 4. And finally it comes to me and it works out. I look at magazines, the internet, image galleries until something just sparks. Despite all of the angst involved with this - I love this show. I am so interested in how other designers see the category. Personally it causes me to think in very different ways and pushes me to be both creative in the interpretation of the topic and to deliver solutions for working with materials I have never worked with before. The technical challenges in working with materials that I have never used are often built from what I do know and adapt to these unusual starting materials. It is amazing how much it has opened my mind to alternative solutions with uncommon tools, equipment and techniques. This year's project was to be made from items to be purchased in a hardware store. It starts like any other project - surveying the store to see what is available. You begin to think what pattern will I use, how will the materials be fastened together, will it be too thick, too heavy, how will I "sew" them together. We used duct tape , rivets, eyelets, wire jump rings, wire, sheet metal and washers and parts from strainers. 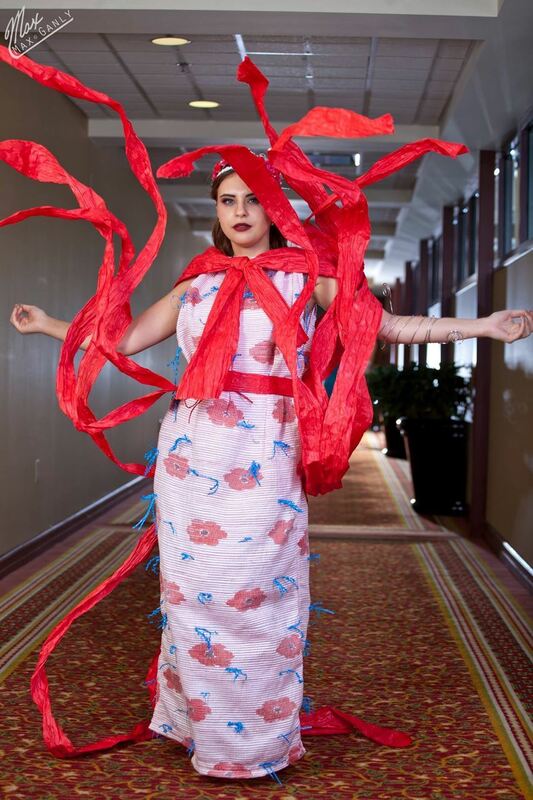 Sarah really sold the garment on the runway and did a terrific job. It won first place in the category and is hanging in the Bellagio Every Day window in downtown Asheville until the 21st. I am lucky enough to teach what I love. 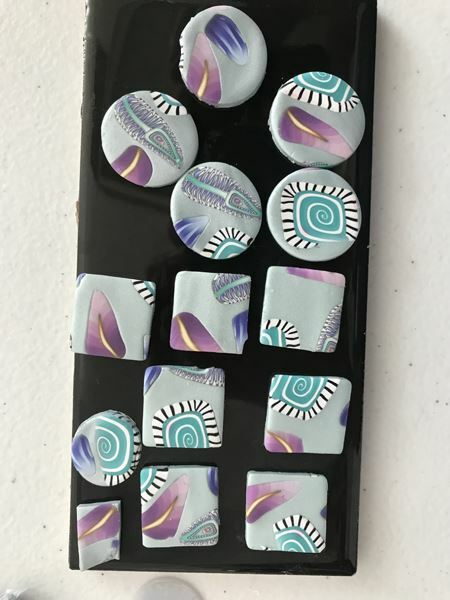 Recently though I have been on a kick to take classes myself and I have learned a number of things. I have realized that learning something new is more daunting than I remember. I want more things written down because two months later when I get back to it I surely won't remember the fine details of my new craft. And I need pictures or videos of the details to help remember the new skills. These experiences are helping me with my classes and I will try to make improvements. I have also learned how much fun it is to take something completely out of my element and see a project from a whole different perspective. I like being in a class instead of the solitude, with no feedback, from reading a book and trying to make it work. I like how a teacher can show me the slight turn of the hand to make a better stitch or knot that I never would have picked up from a book. I like seeing what others are doing and receive critique. And I like seeing how a class of students, that are all learning the same technique interpret it in such a different manner. I have taken a felt bootmaking, a jewelry making, a doll making and the polymer clay class. While I doubt any will become a passion of mine I have learned I like my felting technique better, learned to use tools I have never used, learned more about color and design and learned the value and boost I get from completing something in a short period of time and being successful and done. I hope you find something of interest to take this year with Local Cloth to boost your energy and creativity. My stint as Local Cloth Resident Artist on Thursdays started with a wonderful weaving challenge. 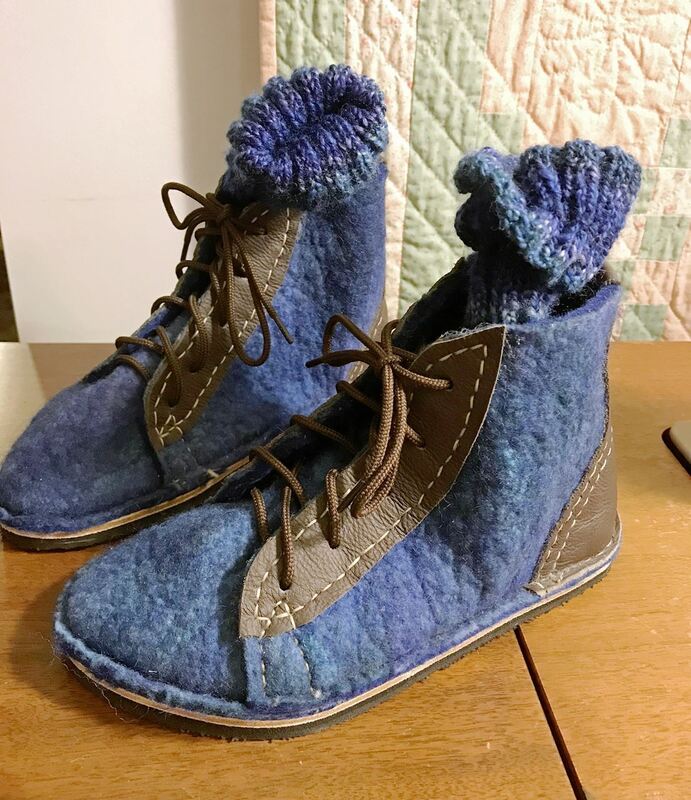 Judith Henry is an intermediate weaver, coming to weaving from an extensive knitting background. 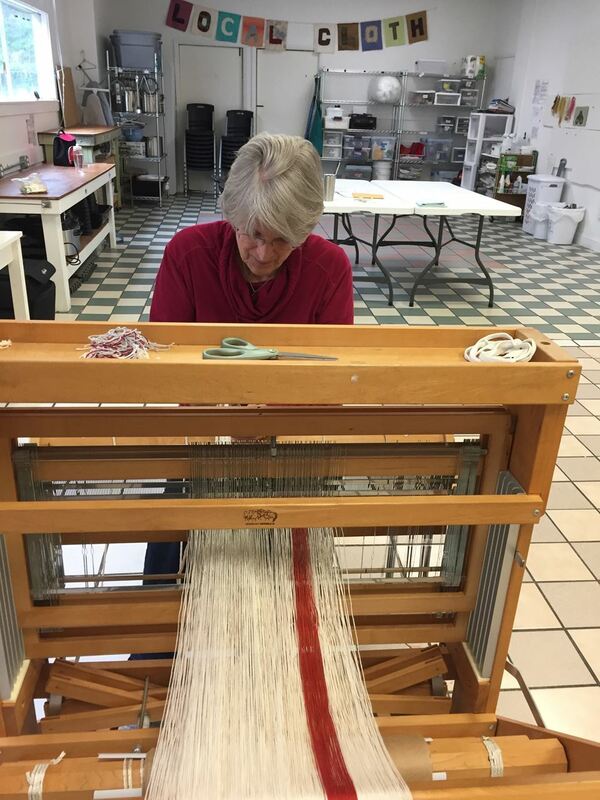 She wants to weave a tablecloth, but the width is not possible on her loom. She read about using double weave to weave a cloth twice as wide as her loom. The two layers are connected on only one selvage. The challenge, her research revealed, was how to deal with draw-in at the fold side which can make the fold very obvious when it is opened out. She came to me for help finding the best solutions. I am not an expert in double-width weaving, so I researched recommendations from several sources and set up a sampling study for her to explore them. Judith signed up for two six-hour packages of my Shaft-Loom Weaving On-going Classes and just completed her study. The results were very dramatic. In addition to overall suggestions for minimizing draw-in — leaving enough weft in the shed, advancing the warp every 1 to 1.5 inches and winding bobbins very tightly — I offered a series of experiments to test techniques specific to double-width. The first was to position the fold on the weaver’s best selvage. Most weavers find one selvage always weaves more neatly than the other. For Judith, it was the right selvage, so she made sure to thread the warp stripes in her pattern so the fold would be on her right. We tried an adjustment in sleying at the fold side, choosing a recommendation to sley the second grouping (of 4 ends) from that selvage at half density (2/dent). The final four ends on that side were sleyed at normal density(4/dent). Then she wove several different samples: one with a fishing line floating selvage at the fold; one with a fishing line floating selvage on both sides (All the fishing line is removed after weaving, so it doesn’t permanently close the “open” side. ); and another with fishing line threaded through heddles with the last two ends of each layer, without floating selvages. Judith also sampled each of these options with no density adjustment on the fold side. Yes, this meant cutting off and wet finishing samples as she wove, so she got lots of practice cutting off and lashing back on. Because we were in the Local Cloth studio, I could wash and press the samples while she was weaving, so we had immediate results to judge. We removed the fishing line, and tried threading in smooth yarn with the last two ends on the fold instead, trying this with a couple of different density adjustments at the selvage, and two different sizes of mercerized cotton. In the end, Judith achieved the best results (an invisible fold line) with her third sample which threaded the fishing line with the last four ends on the fold side. 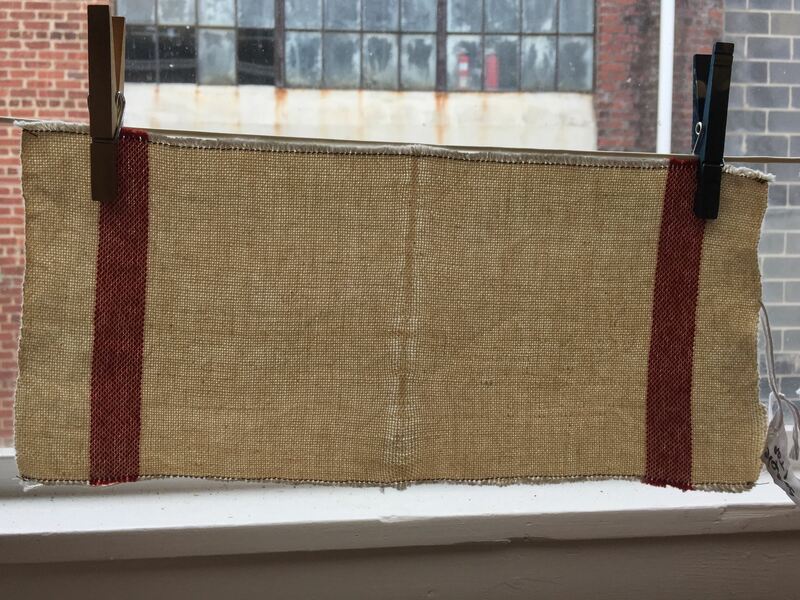 I’ve included some pictures of samples 1-3 hanging in the studio after wet finishing: one with no fishing line, second with fishing line floating selvage at fold, third with fishing line threaded into selvage ends. Another double-weave tip: use a mirror to check for weaving errors on the bottom layer. That doubled weft in sample 3 turned out to be a twist in the 8/2 weft that got caught in the shed. We didn't see it until it was cut off the loom. 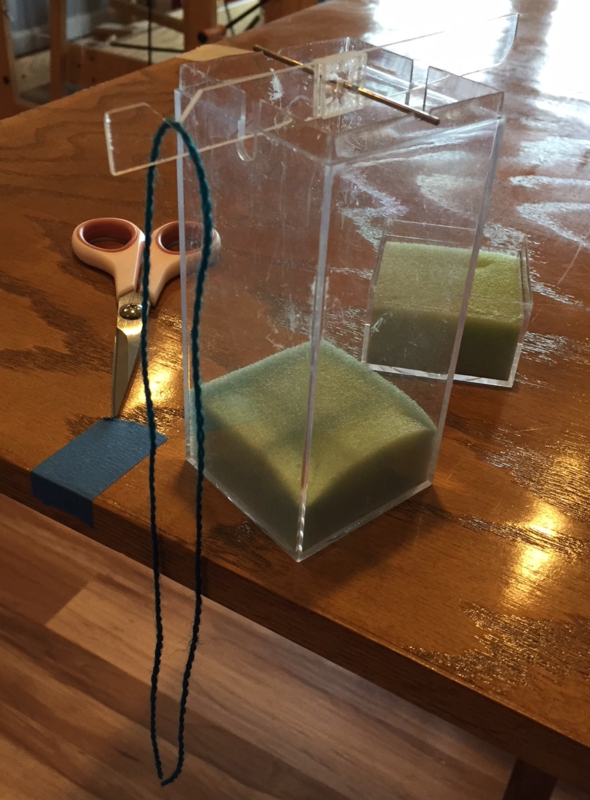 None of the samples using yarn instead of fishing line produced an invisible fold. We acknowledged this was a narrow sample with which she was taking great care at the selvages. On a wider piece when the shuttle is being thrown through the shed, this may work better. 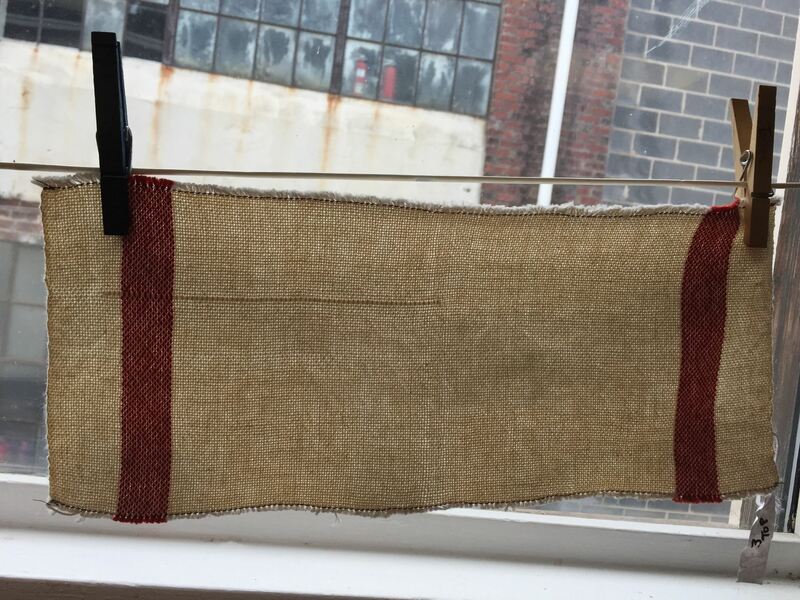 She also liked the results using a fishing line floating selvage on the open side, and plans to use cotton-linen blend for her tablecloth vs. the 8/2 unmercerized cotton she used in her sampling. All of which will require…more sampling. So for the tablecloth, she will add another yard of warp, sample those variables, and cut them off and wash them before making her final decisions. Oh, and we have one other recommendation for anyone who wants to conduct similar experiments: colored fishing line vs. clear is a lot easier to manage. If you have a weaving challenge you would like to explore, or you have always wanted to give weaving a try, please get in touch. I’d love to help you. Welcome to the new Local Cloth Blog. Here our purpose is to educate, enlighten and engage with our members and friends in the textile and fiber arts world. We will bring you information you can use to develop as a fiber artist and a business person. We will share travelogues of interesting fiber and textile locales around the world. We will keep you up to date about trends in the local fiber movement. We will introduce you to Local Cloth members and other fascinating textile artists we meet along the way. And we invite you to follow along and engage with us and other followers in conversations that expand fiber arts industry knowledge for all of us. If you have a fiber arts blog, send us a post now and then and we may share it here to expand your reach. Don't forget the pictures! In short, we want to connect with you and build a platform where we can all learn from each other. To join us on the journey, click the RSS button above so you'll be notified of the latest posts. To submit a blog post for review, send to info@localcloth.org.